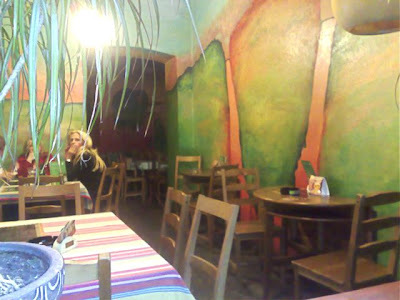 I mentioned to a colleague that I'd never found any exceptional Mexican food in Prague. He recommended Žlutá pumpa (The Yellow Pump) in Vinohrady. 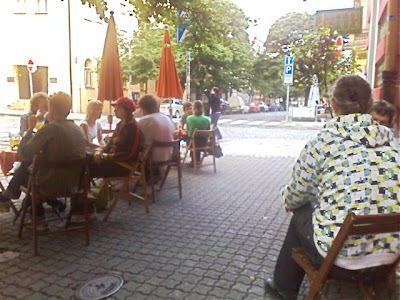 We walked there on a Sunday night and found a table outside. I'd been away all weekend at a wine tasting in Moravia, so we had some conversational catching up to do. I'd walked by the restaurant a number of times, and it always looked full, so I thought we were lucky to get some seats. We put in our orders. 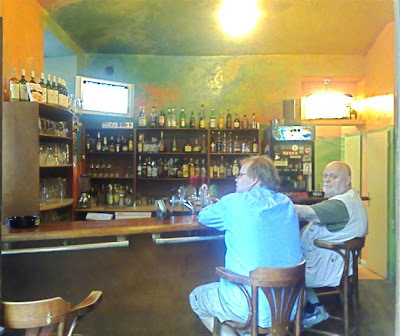 The place was only half full on this evening, but it appeared there was only one waiter serving everyone. It took 45 minutes for our food to appear. I'm pretty predictable. 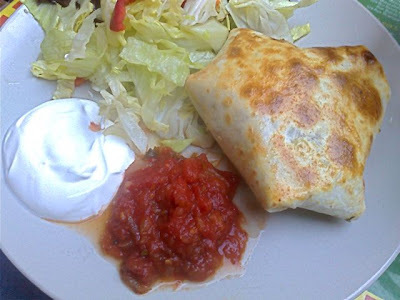 I ordered the chimichanga (98 CZK). It was filled with big pieces of chicken breast, a few red beans, tomatillos, jalapenos, and salsa. 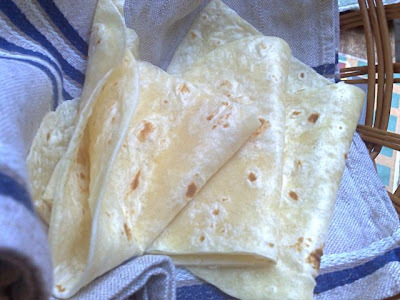 The flour tortilla was lightly crisped on the outside, but was not deep fried. It was relatively small as chimichangas go. The filling was fairly simple. But I liked it. Their salsa really made it work. It is excellent, with lots of tomato and a powerful kick of cilantro. I love cilantro. There was more salsa on the side, along with sour cream, and a pile of undressed lettuce that I thought was mostly a waste. 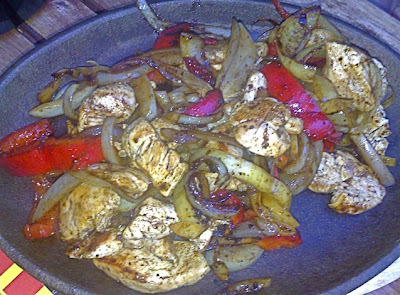 V ordered the chicken fajitas (150 CZK). The meat came out on the expected iron skillet, mixed with onions and peppers. Contrary to expectations, it was not sizzling on arrival. It was hot, though. The chicken did not taste of chili or classic Mexican seasoning. We couldn't really discern the spices on it, but it still tasted fine. There were warm flour tortillas in a basket on the side. 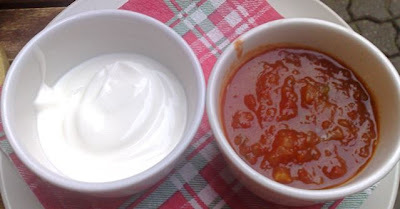 And there was the great salsa and sour cream. I would have loved some refried beans, but they didn't come with this dish. 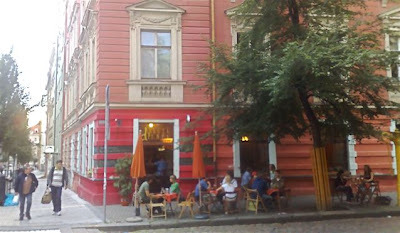 For drinks, V had two glasses of white wine (32 CZK each). 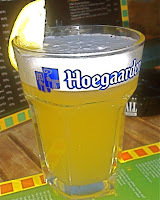 We also shared a half-liter of Hoegaarden with a slice of lemon (42 CZK). They also have Pilsner Urquell and Staropramen on tap. We drank two bottles of Korunni sparkling water (20 CZK each). Still feeling hungry, I decided to order dessert. I got the cinnamon crisps (55 CZK). 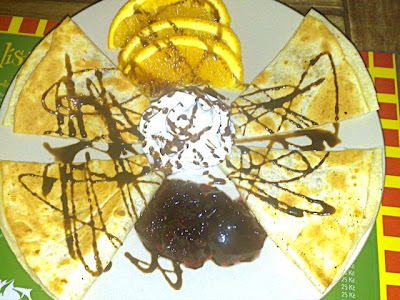 It was a flour tortilla, pan fried with cinnamon sugar in the middle. The menu said it came with sour cream, but there was, thankfully, whipped cream in the middle. It was nothing fancy, but I have a great weakness for anything with cinnamon sugar. I grew up eating cinnamon toast, so I liked it. V did, too. I do wish the tortilla was cooked to a higher level of crispness. There was also a mound of jam on the side, which I didn't really need. There were orange slices, but unfortunately, they had obviously shared a cutting board with some garlic. Not a good combo. The total bill was 449 CZK. Almost all the burritos were around 100 CZK, and there were quite a few different combinations. 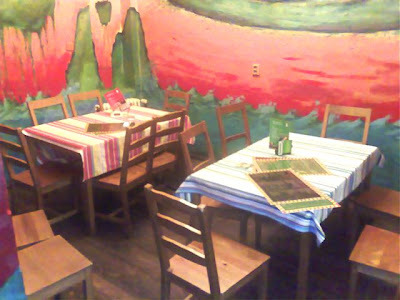 Žlutá pumpa may not be an authentic Mexican culinary experience, but it was better than I expected, considering the prices. So, we'll be going back for some more conversation. And the other kinds of food, too. Hello, I liked your article. I most say that mexican food doesn't taste good in other countries. I dont know why do they put mexican food if they dont know how to make it. If you visit mexico, msg me, I can carry you to taste delicious food, spicy and cheap!! I wish I would go Prague!! !